Mocking community organizers, the GOP attacks a tradition of collective self-help that's made America a more humane country. 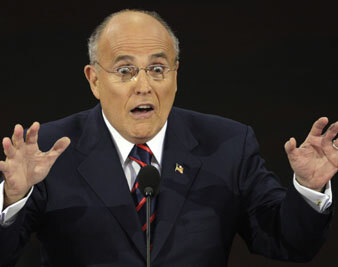 Rudy Giuliani at the RNC on September 3, 2008. For the first time in American history, a major political party devoted a substantial portion of its national convention to attacking grassroots organizing. The party of Ronald Reagan was touting government experience over civic engagement. At a convention whose theme was “service,” GOP leaders ridiculed organizing, a vital kind of public service that involves leadership, tough decisions, and taking responsibility for the well-being of people often ignored by government. Palin, Giuliani and Pataki denigrated not only the tens of thousands of community organizers who help everyday citizens to participate in shaping their society and the millions of Americans who volunteer as community activists but also a long American tradition of collective self-help that goes back to the Boston Tea Party. Visiting the United States in the 1830s, Alexis de Tocqueville observed in his Democracy in America, how impressed he was by the outpouring of local voluntary organizations that brought Americans together to solve problems, provide a sense of community and public purpose and tame the hyper-individualism that Tocqueville considered a threat to democracy. In the same speech in which Palin ridiculed Obama’s organizing work, she touted her own experiences as a PTA volunteer and “hockey mom”–the very kinds of activities that Tocqueville praised and that community organizers support. The Republicans’ nasty attacks on grassroots organizing reflect another longstanding tradition in American politics–the conservative elite’s fear of “the people.” Some of the founding fathers worried that ordinary people–people without property, indentured servants, slaves, women and others–might challenge the economic and political status quo. In The Federalist Papers and other documents, they debated how to restrain the masses from gaining too much influence. To maintain their privilege, the elite denied them the vote, limited their ability to protest, censored their publications, threw them in jail and ridiculed their ideas to expand democracy. But grassroots activists wouldn’t give up. Every fight for social reform since colonial times–including battles to abolish slavery, promote workers’ rights, fix up slum housing, strengthen civil rights, clean up the environment, expand women’s rights and protect consumers–has reflected elements of that self-help tradition. Modern community organizing, an important strand of grassroots activism, began with Jane Addams, who founded Hull House in Chicago in the late 1800s and inspired the settlement house movement. These activists–upper-class philanthropists, middle-class reformers and working-class radicals–organized immigrants to clean up sweatshops and tenement slums, improve sanitation and public health and battle against child labor and crime. In the 1930s, another Chicagoan, Saul Alinsky, sought to organize residents the way unions organized workers. Drawing on existing groups–particularly churches, block clubs, sports leagues, and unions–he formed the Back of the Yards Neighborhood Council to get the city to improve services to a working-class neighborhood adjacent to meatpacking factories. A half-century later, in 1985, 23-year-old Barack Obama moved to Chicago to work for the Developing Communities Project, a coalition of churches on the city’s South Side. His job was to help empower residents to win improved playgrounds, after-school programs, job training, housing, and other concerns affecting a neighborhood hurt by large-scale layoffs from the nearby steel mills and neglect by banks, retail stores and the local government. He knocked on doors and talked to people in their kitchens, living rooms and churches about the problems they faced and why they needed to get involved to improve their communities. There are at least 20,000 paid organizers in the United States, according to Walter Davis, executive director of the National Organizers Alliance. They work for community groups, environmental organizations, unions, women’s and civil rights groups, tenants organizations, churches and school reform efforts–touching the lives of millions of Americans every day. They work long hours, usually for low pay. Organizers identify people with leadership potential, recruit and train them and help them build grassroots organizations that can win victories that improve their communities and workplaces. They force cities to put up stop signs at dangerous intersections, organize crime-watch groups and make sure their churches or synagogues shelter the homeless. They force slumlords to fix up their properties, challenge banks to end mortgage discrimination and predatory lending, improve conditions in local parks and playgrounds, increase funding for public schools, clean up toxic sites, stop police harassment and open community health clinics. They even help parents organize hockey and soccer leagues and get local governments to let them use municipal fields and rinks. As mayor of New York, Giuliani had many confrontations with community organizations. One was East Brooklyn Congregations (EBC), an affiliate of the Industrial Areas Foundation network of community groups. In the 1990s, EBC, comprised primarily of religious congregations and their working-class members, pressured Giuliani to provide city-owned land so the group could expand its nonprofit Nehemiah housing development of affordable single-family homes. Giuliani has since forgotten those words of praise, but he was correct. Community organizers make democracy work by mobilizing people to inject long-ignored issues onto the public agenda and hold politicians accountable. They help give people the confidence they need to use the tools of democracy. In a society where wealth and income is concentrated in a few hands, grassroots organizations make it possible for ordinary Americans to find their civic voice and exercise influence in politics. Our democracy works best when people come together to solve problems, not simply by voting every few years but also by participating in a wide array of voluntary organizations–the “civil society” that serves as a mediator between the power of business and money and the authority of government. Politicians need to listen to people’s problems, help them forge solutions, and give voice to their hopes, rather than stoke people’s fears and prejudices. At critical moments, Presidents have embraced activist movements and helped propel them forward. To win the right to vote, the suffragists combined decades of dramatic protest marches and hunger strikes with lobbying and appeals to the consciences of legislators–some of them the husbands and fathers of the protestors. Woodrow Wilson, no friend of feminism, reluctantly changed his position and supported women’s suffrage. Lyndon B. Johnson, initially unsympathetic to the civil rights movement, later recognized that the nation’s mood was changing because of the willingness of activists to put their bodies on the line against fists and fire hoses, along with their efforts to register voters against overwhelming opposition. That activism transformed Johnson from a reluctant advocate to a powerful ally. To win significant reforms, organizers and politicians need each other. Voter drives, boycotts, strikes, civil disobedience and mass marches help inject new issues on the agenda, dramatize grievances, generate media attention and get people thinking about things they hadn’t thought about before. Today, we need grassroots organizing more than ever. Now comes Obama, a one-time community organizer, who consistently reminds Americans of the importance of community activism. If he’s elected President, he will have to find a balance between working inside the Beltway and encouraging Americans to organize and mobilize. He understands that his ability to reform healthcare, tackle global warming and restore job security and decent wages will depend, in large measure, on whether he can use his bully pulpit to mobilize public opinion and encourage Americans to battle powerful corporate interests and members of Congress who resist change. Republicans thought they were being smart mocking community organizing. But what they didn’t understand is that their smug comments weren’t simply an attack on Barack Obama but on the entire grassroots chain of change that has, for over 200 years, made America a more democratic and humane country. John AtlasJohn Atlas, president of the National Housing Institute and author of Seeds of Change: The Story of ACORN (Vanderbilt University Press, 2010) is working on an ACORN documentary.